Pure simplicity, very subtle sense of of a landscape. This kind of canvas works well in so many spaces and is so beautiful to the eye and soul. 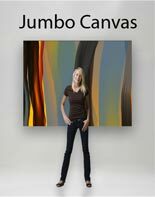 Skinny version of our very popular canvas, Kansas.